It’s 2018 and corridor clutter remains a frustration for hospitals. It’s always on the radar for Joint Commission surveyors – annually appearing as one of the top cited Life Safety standards. In hospitals across the country many initiatives are launched to clear the clutter but frequently fall short of solving the problem. The fact is facilities management needs their leadership support to succeed in solving this problem. 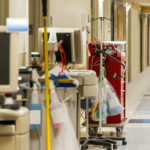 Lahey Hospital leadership stepped up to help tackle this safety issue, resulting in clutter-free corridors – and some other unexpected benefits.